The Global Volcanism Program has no activity reports for Lake Yojoa. The Global Volcanism Program has no Weekly Reports available for Lake Yojoa. The Global Volcanism Program has no Bulletin Reports available for Lake Yojoa. The Lake Yojoa volcanic field consists a group of Pleistocene-to-Holocene scoria cones and collapse pits at the northern end of Honduras Lake (Williams and McBirney, 1969). The volcanic field has produced rocks ranging from tholeiitic basalts to trachybasalts, trachyandesites, and trachytes. The principal NE-trending chain of cones cuts through Cerro Babilonia, the high point of the field, along the same fault pattern that bounds the limestone mountains bordering arcuate Lake Yojoa. Most of the pyroclastic cones, consisting of basaltic scoria and agglutinate, are 100-200 m in height and several contain well-preserved craters. Lava flows radiate in all directions from the cones. The longest flow traveled N to the village of Río Lindo, where a waterfall cascades over the terminus of the flow. A few Quaternary lava flows occur in the Sulu graben along the Carretara del Norte N of Lake Yojoa. Walker J A, Patino L C, Cameron B I, Carr M J, 2000. 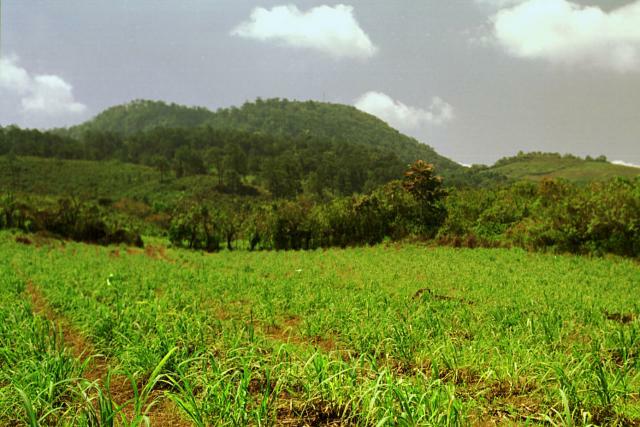 Petrogenetic insights provided by compositional transects across the Central American Arc; southeastern Guatemala and Honduras. J. Geophys. Res, 105: 18,949-18,963. Williams H, McBirney A R, 1969. 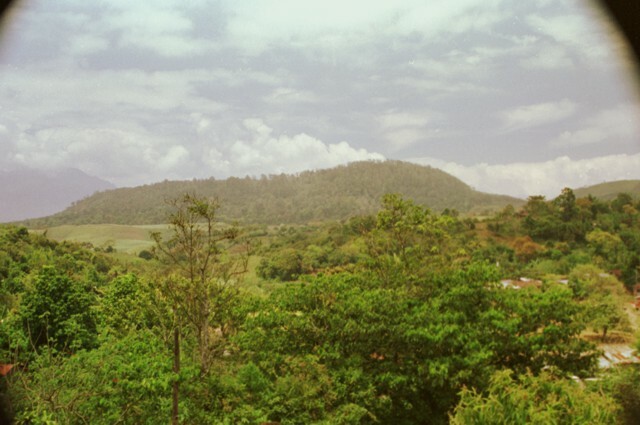 Volcanic history of Honduras. Univ Calif Pub Geol Sci, 85: 1-101. The Global Volcanism Program is not aware of any Holocene eruptions from Lake Yojoa. If this volcano has had large eruptions (VEI >= 4) prior to 10,000 years ago, information might be found on the Lake Yojoa page in the LaMEVE (Large Magnitude Explosive Volcanic Eruptions) database, a part of the Volcano Global Risk Identification and Analysis Project (VOGRIPA). There is no Deformation History data available for Lake Yojoa. There is no Emissions History data available for Lake Yojoa. 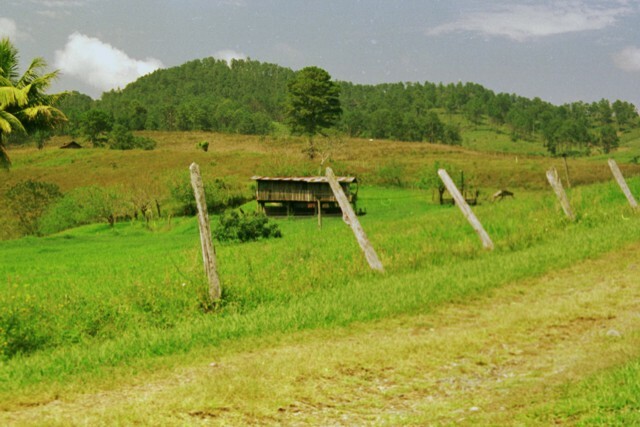 El Volcán is the oldest and most dissected of a group of pyroclastic cones north of Lake Yojoa. El Volcán lies at the SE end of the cluster of cones near the lake. The cone, now mantled by scoria from younger cones, fed a series of basaltic lava flows that underlie a flat valley to the SE (to the right of this photo). Photo by Rick Wunderman, 1999 (Smithsonian Institution). Cerro el Hoyo lies at the SE end of a subsidiary NW-SE-trending chain of pyroclastic cones of the Lake Yojoa volcanic field about 2 km NE of the lakeshore. The cones are surrounded by lava fields that are partially tholeiitic in composition, but mostly consist of trachytes, trachybasalts, and trachyandesites with large phenocrysts of sanadine and anorthoclase. The SW-most of a chain of NE-trending cinder cones is the largest of a cluster of cones north of Lake Yojoa. This large cone was constructed at the intersection of two roughly orthogonal chains of young pyroclastic cones. The cones of the Lake Yojoa volcanic field were built along fissures; these parallel faults that also define the rectilinear shores of the lake and cut Cretaceous limestones on the west side of the lake. A large low-rimmed crater lies immediately WNW of Cerro el Hoyo. 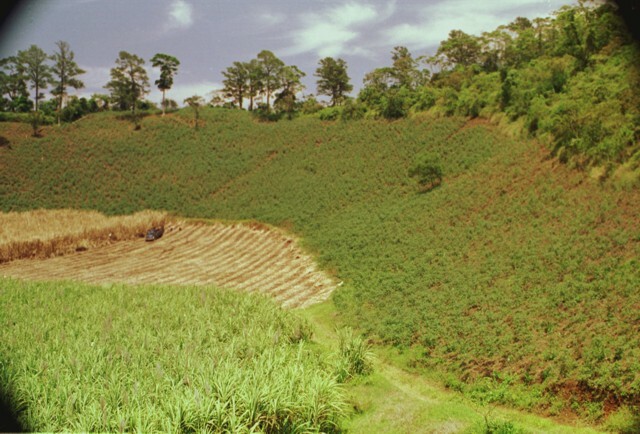 The floor of the crater has been planted with sugar cane, and other crops line the walls of the crater. The scale of the 1-km-wide crater is deceiving--note the barely visible truck and sugar cane workers on the crater floor at the left center. 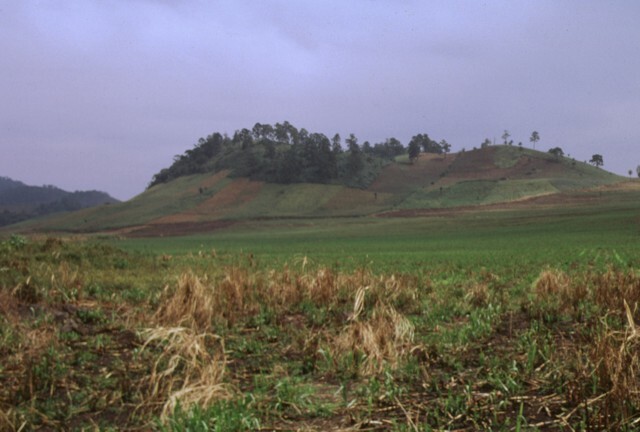 This eastern side of forested Cerro Babilonia cinder cone rises above fields north of Lake Yojoa in north-central Honduras. The 1090-m-high cone is the highest of a chain of Pleistocene-to-Holocene scoria cones at the northern end of the lake. The cones were constructed along orthogonal NW-SE- and NE-SW-trending lines and consist of basaltic scoria and agglutinate. The are typically 100-200 m in height and several contain well-preserved craters. Lava flows radiate in all directions from the cones. 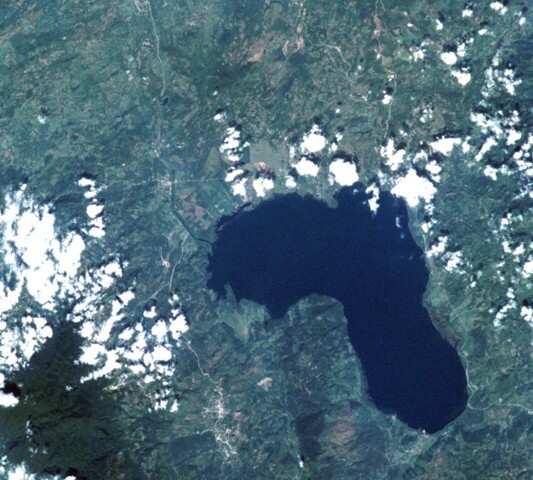 The Lake Yojoa volcanic field forms the entire northern shore of the 10 x 12 km long lake, the largest in Honduras, in this Space Shuttle image with north to the upper left. Cretaceous limestones lie west of the lake, and Tertiary volcanic rocks to the east. Vents of the volcanic field, which extends to the top of the image, are concentrated along two NW- and NE-trending lines. The Lake Yojoa volcanic field has produced both tholeiitic and alkaline basaltic rocks. NASA Space Shuttle image ISS001-350-18, 2001 (http://eol.jsc.nasa.gov/). There are no samples for Lake Yojoa in the Smithsonian's NMNH Department of Mineral Sciences Rock and Ore collection. Large Eruptions of Lake Yojoa Information about large Quaternary eruptions (VEI >= 4) is cataloged in the Large Magnitude Explosive Volcanic Eruptions (LaMEVE) database of the Volcano Global Risk Identification and Analysis Project (VOGRIPA).